In Zimbabwe 80% of people depend on agriculture for a living. Most farms are small. Like many places in Africa, the majority of farmers are women and they play a central role in growing food crops. 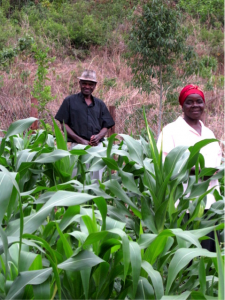 Zimbabwe also has a long tradition of using indigenous knowledge to deepen ecological and sustainable practices in agriculture, although these have been under threat and under-resourced for decades. Fortunately, there is a network of individuals, communities and organizations that have worked to revive, strengthen, and spread these techniques through agro-ecological practices such as permaculture, inter-cropping, and zero tillage. It was very inspiring to see the beautiful and hard work carried out in ecological farming in the country, where community and farmer groups have made spectacular progress with managing their local natural resources. One such group is CELUCT – the Chikukwa Ecological Land Use Community Trust. 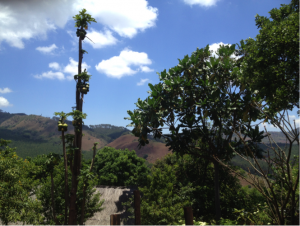 Visiting CELUCT, in the breath-taking and remote Chimanimani district in the eastern Zimbabwe highlands, I saw a thriving example of what we call community self-determination and the deep practice of agro-ecology. Five local youth started CELUCT in the 1990s, coming together to tackle some significant community challenges. In this region, harmful farming practices and big development projects that had encouraged monoculture for export purposes had resulted in land degradation, soil erosion, dried up springs, high levels of malnutrition, and other environmental decline. Faced with such enormous challenges, these young people began to tackle regenerative practices that focused on soil revival and water conservation. CELUCT went on to set up a community watershed management system and establish a training center that provides overnight accommodation and delicious organic meals that I enjoyed during my visit. Their immense curiosity and determination was channeled into continuously developing new and sustainable agro-ecological initiatives that the community could support. This spirit of volunteerism, self-sufficiency, and community-based action became instrumental in sustaining this community through some very difficult economic, political, and climatic changes in Zimbabwe. As I came to see, CELUCT is built on a profound vision of community ownership and engagement in the conservation of local resources, and there are now many excellent practitioners of ecological agriculture and permaculture. Virtually the whole community is involved to varying degrees, with strong engagement from women and youth. 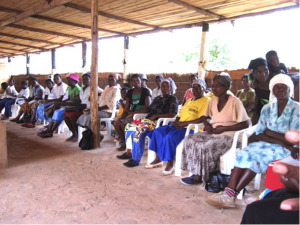 For instance, there are more than 5,000 farmers in the Chikukwa Permaculture Club, many of whom are women. And it was delightful to see women take a strong lead with farmer-to-farmer learning taking place at the CELUCT Center when I visited. They were sharing their knowledge and exchanging effective practices during the planting season, just as the first rains of the season arrived in this highland area. Reviving the use of local seeds is another area of success for CELUCT. Through their Seed Saving Program, the community has made significant progress in protecting traditional open-pollinated varieties (OPV). On “Field Days” farmers compare the quality of their seeds, and enjoy selecting the best matches for yield and resistance to drought. It’s not surprising then that the community is also enjoying the revival of delectable indigenous food varieties. They are able to consume beautiful, tasty, and higher quality vegetables. 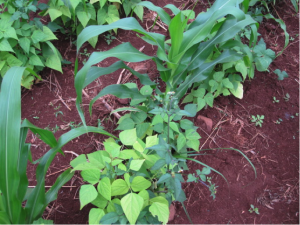 These successful, local, seed saving practices are crucially important in these times, when genetically modified seeds and chemical fertilizers and pesticides are being pushed on small scale farmers all over Africa. Of related importance is the issue of value addition for local produce and raising extra income for additional family and community needs. CELUCT has tackled this through a focus on agro-processing and marketing of organic produce. A spin-off organization, TSURO Trust, provides valuable assistance by buying produce directly from the farmers, and assists with processing and distribution. This is something we can learn from as the community intensifies its economic viability. Harmony in the communities is also a central element for the ongoing success of these local achievements. CELUCT is therefore addressing community needs around cultural identity, indigenous knowledge, and inter-generational learning. A Culture Club grew out of discussions between traditional leaders and elders and younger people in the area, on the value of their cultural heritage. Furthermore, CELUCT’s Building Constructive Communities program tackles the peaceful resolution of everyday differences, conflicts, and misunderstandings. For this purpose, CELUCT has developed and implemented a highly effective and invaluable tool called the “Three Circles of Knowledge.” First they use the Indigenous Knowledge Circle (how would the ancestors resolve this issue? ); then move to the Spiritual Knowledge Circle (what are the answers according to your spiritual beliefs? ); and finally the Analytic Knowledge Circle (what does your formal or informal education tell you?). All of these strands are then brought together and discussed to find a constructive solution to the issue at hand. There is much to learn from how this remarkable example of community self-reliance in food production has transformed Chikukwa into a thriving model for agro-ecological practice, peaceful conflict resolution, and community-based food sovereignty. Moreover, coupled with the community stewardship of their local environment, Chikukwa also presents a shining illustration of how to build local resiliency in the face of climate change.